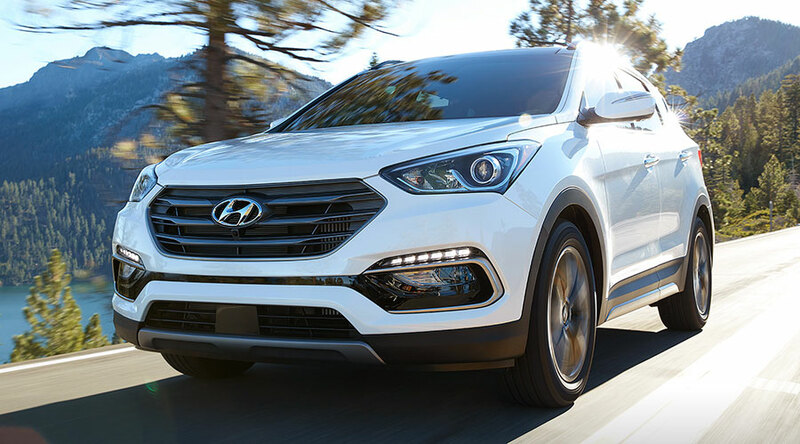 The Hyundai Santa-Fe Sport is an athletic crossover SUV that's designed to maximize passenger space, on-road performance, and modern tech features. With room for up to five, the Santa-Fe Sport is the perfect pick for families and outdoor enthusiasts. You'll also find that this compact crossover is versatile and big on cargo space. Its status as a newer model means that even used buyers can expect an impressive range of high-tech safety and infotainment gear. Finally, Hyundai's generous warranty coverage puts the cherry on this excellent crossover SUV. Take a Santa-Fe Sport out for a test drive today! Although the Hyundai Santa-Fe Sport is officially a compact crossover SUV, it's larger than many rivals, offering major appeal with its five-seat accommodations and roomy cargo hold. Up front, you'll love the Santa-Fe Sport's commanding view of the road and supportive driver seat. In both rows, passengers can count on ample head-, elbow-, and legroom. The panoramic sunroof adds to the cabin's feeling of wide-open space. 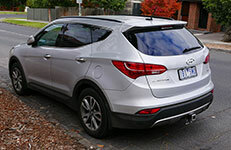 Used Hyundai Santa-Fe Sport buyers can look for two trim models, the base and 2.0 Turbo. Both are handsomely equipped with comfort and convenience features. The Santa-Fe Sport cabin helps you make the most of a lengthy ride with niceties like heated and ventilated seats. The Blue Link telematics system adds a layer of safety with features like automatic collision notification. Bluetooth phone and audio connectivity give you the power to make hands-free calls on the go or stream your favorite tunes. With keyless ignition and entry, the Santa-Fe Sport saves you plenty of time in the parking lot. Xenon headlights give this crossover a sleek, modern vibe. If safety is on your mind, look to the used Hyundai Santa-Fe Sport to ease your concerns. Recent model years have come away from government crash tests with a perfect five-star rating for overall protection. The Insurance Institute for Highway Safety gave the Santa-Fe Sport its top rating of "Good." With the 2.4-liter four-cylinder engine, your Santa-Fe Sport generates 190 horsepower and 181 pound-feet of torque. This healthy output means steady acceleration and easy highway passing maneuvers. This engine is paired with a responsive six-speed automatic that delivers a smooth, comfortable ride. For additional engine power, look for the 2.0 Turbo model. Its turbocharged, 2.0-liter engine produces 264 horsepower and 269 pound-feet of torque for major speed and an overall performance bump. No matter where you plan to travel, the used Hyundai Santa-Fe Sport is an amiable companion. For city life, this crossover is composed and confident. It handles well around turns, so you can navigate tight spaces with ease. It's also a great pick for winding mountain roads or lengthy highway rides. Both engine options give you the support you need to merge into fast-moving traffic or tow heavy loads. You'll also find that the Santa-Fe Sport helps you make the most of the money you spend at the pump.